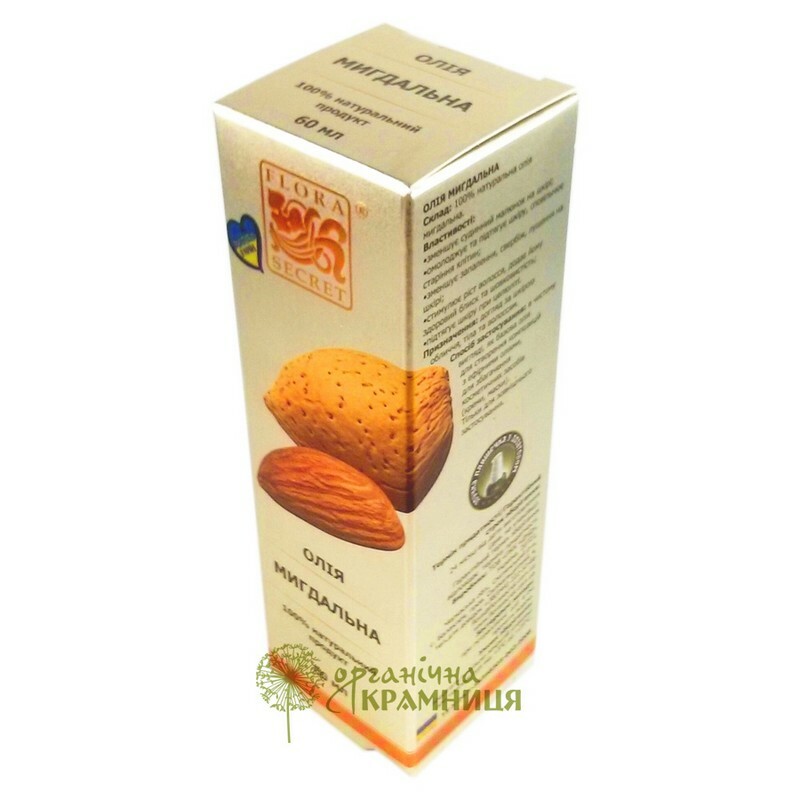 Almond oil is produced by the Ukrainian brand Flora Secret. This 100% natural oil is derived from high-quality and raw material. Almond oil is extracted from either sweet or bitter almonds. It is a rich source of nutrients (especially vitamin E) and is widely used as a cosmetic product for hair, skin and nail care. Composition. Almond oil is rich in fatty acids such as oleic acid, linoleic acid and palmitic acid. It also contains phytosterols, vitamin E, bioflavonoids, carotenes, proteins, magnesium, iron, sodium, phosphorus, zinc, and other useful substances. Properties and use. Almond oil has a lot of useful properties, it is considered a universal cosmetic oil. For example, it has a rejuvenating and lifting effect. Almond oil helps to improve complexion and cope with skin flaking, inflammation, itching and irritation. Besides, it nourishes and hydrates the hair, stimulates its growth and makes the hair look silky and shiny. Directions. The oil can be applied as is or mixed with other carrier oils. It can be used to dilute essential oils or to enrich creams and other cosmetics. Ingredients. 100% Natural Prunus Amygdalus (Almond) Oil. Want to buy Almond Oil? Call us or submit your order via our web site! Flora Secret is a Ukrainian brand of natural cosmetics that is very popular in Ukraine and its neighbouring countries. It was launched in 2007. Originally Flora Secret specialised in the production of natural essential oils. In the following years Flora Secret started to manufacture other cosmetic products for hair, face and body care as well as for aromatherapy such as vegetable oils, cosmetic oils (combinations of vegetable and essential oils), essential oil compositions and handmade natural soap. Today, cosmetic oils and soaps branded as Flora Secret are well known to and loved by Ukrainian consumers. Flora Secret products enjoy such popularity because they are derived from natural raw materials purchased from leading European manufactures and undergo thorough quality control at all stages of the production. Besides, they are affordable. Flora Secret sells its products at a comparatively low price so that everyone can buy effective and natural cosmetic oils and soaps.